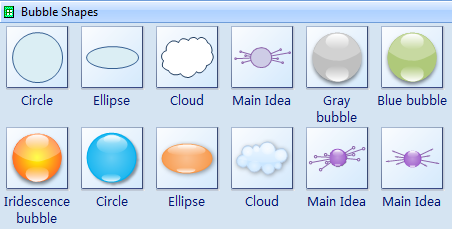 Edraw Max includes some symbols to draw the bubble diagrams. Easy to create the professional-looking bubble diagrams. 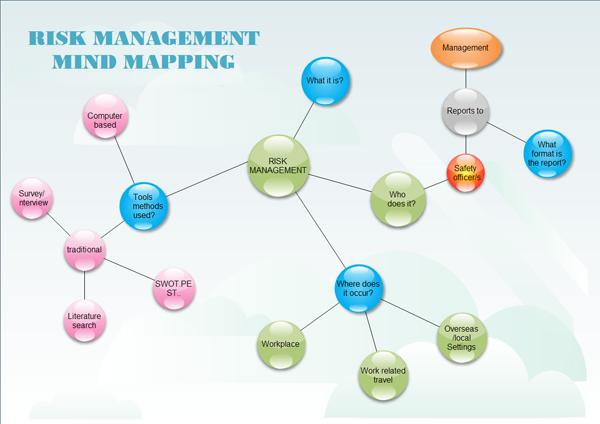 Bubble diagrams are analogs of mind maps, such diagrams are also used in landscape design. Moreover, bubble diagram is a diagram with a bubble presentation of data and the size of a bubble is a parameter of data, too. For example, it can display the importance of the data in diagram or its value. So you can operate three parameters on 2-dimensional diagram - X and Y coordinates of a bubble and its size. It's easy to create professional-look bubble diagrams with Edraw Max. In the Mind Map category, you can double click the Bubble Diagram thumbnail. Then the bubble diagram template will be opened in the symbol panel. The Relationship Diagram or Bubble Diagram is a very simple drawing that consists of roughly drawn bubbles (representing spaces) connected by solid lines, broken lines or wavy lines to specify the type of relationship between the spaces. But Edraw Max includes more high quality highlight symbols to draw the bubble diagrams. Such diagrams are used for ideas organization in brainstorming processes by teachers for explaining difficult ideas or for presentations. Bubble diagrams can be single, double, triple and so on. Single diagrams are used for description of an object or conception. Drag the Main Idea symbol from the bubble shapes panel. Then drag the bubble symbols to the drawing. You can move the yellow control point to change the appearance.